Pedro Rios Jr., October 11, 1999 – July 4, 2014. (Photo courtesy of the Rios family)This is the first piece of a four-part investigative series on the Chicago Police Department and the Independent Police Review Authority. Also see Part II and Part III of the series, as well as this supplement. On July 4, 2014, as the final explosions of Chicago’s lakefront fireworks extravaganza trailed into the water and began fading in the night sky, 14-year-old Pedro Rios Jr. crossed Cicero Avenue in front of an approaching police car, on the northwest side of town. A brown-skinned boy just over 110 pounds, sporting a low fade haircut and the faint beginnings of a mustache, Rios walked in blue-and-white sneakers, shorts and a blue T-shirt – which soon bore the marks of two gunshots, fired into his back by a police officer. The young Chicagoan technically saw the end of his eighth grade year; school had ended for the summer two and a half weeks prior. But given a spell of missed days and poor grades, Rios did not graduate from the neighborhood elementary school he attended with two younger brothers. Pronounced dead on the scene of his encounter with police, he never will. Meanwhile, the Independent Police Review Authority (IPRA) – a City of Chicago agency tasked with investigating police misconduct complaints and weapon discharge notifications – categorized the fatal shooting of Rios as “non fatal” in its statistical report to the public. Such misclassifications are not the only aberrations Truthout discovered in government reporting related to the death of the 14-year-old. Nor is Rios’ shooting the only instance in which a fatal encounter with Chicago police officers disappeared from statistics. According to IPRA spokesperson Larry Merritt, in separate conversations with both Truthout and the Chicago Justice Project, the oversight agency’s numbers are sourced directly from the Chicago Police Department, via the Citizen and Law Enforcement Analysis and Reporting (CLEAR) database. Translated from jargon: Chicago’s municipal government provides accuracy in reporting police violence only to the extent accuracy exists in police data. Even setting the matter of IPRA’s purported independence from the department aside – the revelation is a bombshell. As deaths disappear into database digits, Laura and Pedro Rios Sr. live the reality that their four children are now three. After months of trumpeting free-falling crime rates, as evidence of successful policing, Chicago Police Superintendent Garry McCarthy faces ongoing scrutiny over the department’s statistics. Covered in detail by journalists at Chicago magazine, McCarthy-era crime reporting has seen a small number of murders go uncounted as such, marked in a mysterious non-criminal “death investigation” column instead. For a department intent on measuring success by year-to-date statistics, creatively categorizing crime provides a surefire route for driving down the crime rate, as officers themselves and experts who’ve long studied the numbers, related in Chicago magazine’s report. Analyzing three years of deadly shootings by police under McCarthy’s leadership, Truthout found at least four fatal shootings, in addition to the fatality of Pedro Rios Jr., missing from reports to the public. But as deaths disappear into database digits, and careers are calculated alongside numbers, Laura Rios and Pedro Rios Sr. live the reality that their four children are now three. Near Chicago’s Lake Michigan, in a working-class neighborhood at the edge of city limits, Laura Rios spoke with Truthout by way of an interpreter, sitting at her kitchen table as two preteen sons played with their toddler cousin nearby. “These have been very sad months,” she said, pausing. “It is as if his life didn’t even count, as if he was trash,” she said, her voice quickening at “basura” (“trash”) and then faltering. “That hurts so much as a parent. “Something is not right with all of this,” she added after a silent moment, sitting up straight and brushing the hair from her eyes. However, there is no reason why Laura Rios must live with unanswered questions regarding the death of her second-born child. Since it took place at a surveillance supply company, outfitted with cameras at the incident location, the shooting of Pedro Rios Jr. was captured on video, currently in possession of authorities. Anticipating a request for a protective order from the City barring its public release, Mark Brown of Lane and Lane, the family’s lawyer, will be filing a complaint in federal civil court in coming weeks. Alongside the suit, he will also be requesting a copy of the video and asking the court to deny any request for a protective order. Meanwhile, the official paper trail left in the shooting’s wake is also barred from public viewing, with the Independent Police Review Authority’s investigation precluding a Freedom of Information Act release of records. Against the landscape of an accountability process lacking on all fronts, the killing of Rios reveals profound failures in governance. 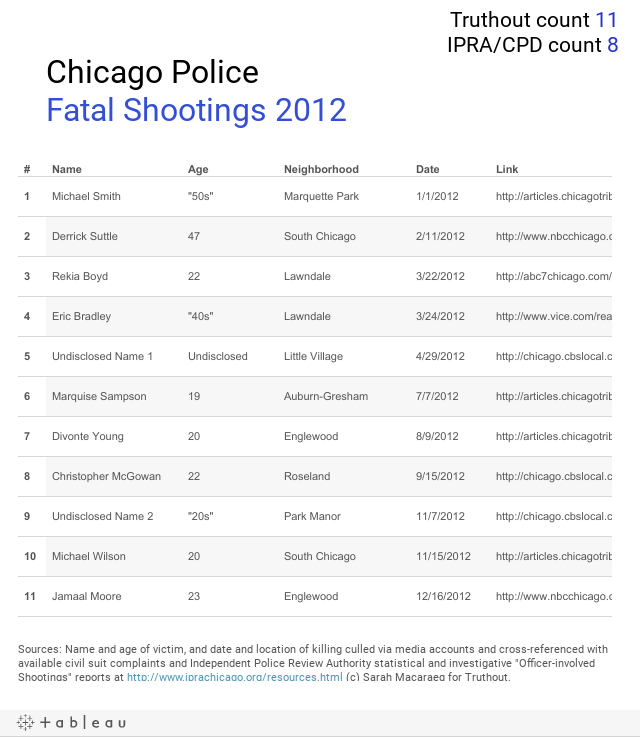 Of the fatal shooting cases closed by IPRA in the years studied, all of the shootings were deemed justified. Investigations lasted an average of 16 months (1) – 10 months beyond the time limit recommended by the US Department of Justice. Among them is the killing of Black 20-year-old Michael Wilson, who was in possession of a hammer when shot by six officers, who collectively discharged 24 bullets. With the bulk of records blocked while IPRA investigates, Truthout found the little information that remains available on the death of Rios, marked by discrepancy after discrepancy – in time of death, (2) manner of death and the alleged chronology of events. Of particular concern: a likelihood surmised from autopsy report details on wound course, that the boy was shot and killed laying face down in an alley, where his body remained for two hours before being pronounced dead. The police account, however, offers a different scenario, in which Rios ran from officers, was shot and continued to run, pivoted, and ran back toward the officer who then tackled him. Delivered by Superintendent Garry McCarthy directly, the account was part of a lengthy public statement, justifying each of the eight police shootings that occurred the same July 4th weekend. Months later, Chicago faces a moment of possibility. With an impending mayoral runoff election, between incumbent Mayor Rahm Emanuel and challenger Cook County Commissioner Jesus “Chuy” Garcia, the prospect of change in all city agencies has been raised. But against the landscape of an accountability process lacking on all fronts, the killing of Rios reveals profound failures in governance beyond any single site of abuse in custody, shooting, statistic or even mayor, revealing policies at all levels of government that stand at odds with best practices, and the human right to life – particularly of Chicago’s Black and young people. In a city where such violations are living history, however, after decades of police torture led by Commander Jon Burge have resulted in his freedom while 19 of those tortured into confessions languish behind bars – and where Truthout uncovered the ongoing purging of the vast majority of misconduct complaints – the precedent of Department of Justice intervention beckons. But the death of a child, shot in the back among a pattern of youth killed similarly, prompts a deeper reckoning as well, with the very basis of authorized deadly force, as it stands across the United States. Pedro Rios Jr. in summer camp, 2012.Seeking to uncover the facts while shedding light on the life of the boy – who mass media initially described as a man, with a “Dirty Harry gun” according to police, Truthout spoke with Rios’ family and former educators, a civil rights lawyer, a criminologist and six medical professionals of varying specialties. Civilians who’ve filed misconduct complaints and a spokesperson and former intern of the Independent Police Review Authority were interviewed, as was the police reform advocate who catalyzed a Department of Justice investigation into the Newark Police Department, helmed by Chicago Police Superintendent Garry McCarthy in the five years leading up to his 2011 appointment. Spokespeople representing Illinois Attorney General Lisa Madigan and the Cook County medical examiner, Dr. Stephen Cina, corresponded with Truthout in the course of the three-month investigation, in which Chicago Police News Affairs and the office of Cook County State’s Attorney Anita Alvarez have not yet responded to multiple requests for comment. Rios was shot twice in the back, and died of gunshot wounds from bullets with an upward course, raising the possibility that the 5-foot-4-inch youth on flat terrain was shot lying face down. With fatal wounds to both lungs, which would have severely and immediately impacted Rios’ breathing – in the autopsy report reading of two separate critical care doctors specializing in pulmonary medicine – the teen was highly unlikely to have been able to run in multiple directions after being shot, as asserted by Chicago Police Superintendent Garry McCarthy in his public statement. Charged with assault of a police officer postmortem, Rios was handcuffed and died in police custody, an “extraordinary occurrence” in Illinois penal and law enforcement terminology. At the Cook County Medical Examiner’s office, Rios’ parents identified their son via photograph. According to a spokesperson, the identification method was in line with office policy. But, Laura Rios and Pedro Rios Sr. described being given no information as to why they could not see their son’s body, despite asking a Cook County interpreter for explanation. A copy of the child’s death certificate, authorized by the medical examiner, lists “suicide” as the manner of death while the autopsy report, performed by the same medical examiner’s office lists “homicide.” A Cook County spokesperson acknowledged the mistake and reported its correction in the state’s vital records database. 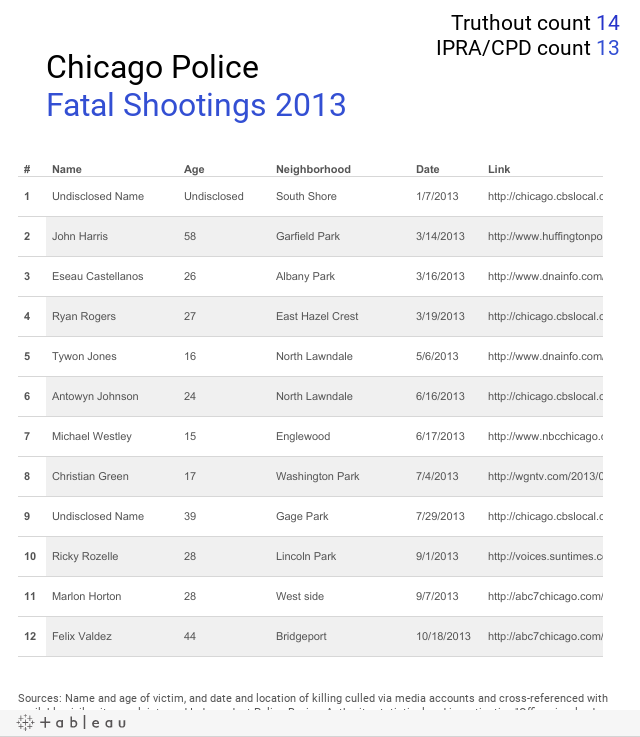 Categorized as “non-fatal,” Rios’ death is among at least five fatal police shootings uncounted in “officer involved shootings” statistical reports from 2012 to 2014, provided to the public by the Independent Police Review Authority and derived directly from the Chicago Police Citizen and Law Enforcement Analysis and Reporting (CLEAR) database. From 2012 to 2014, police shot – and injured or killed – 16 Chicagoans placed in their custody, according to IPRA narrative reports, noting the overlap of extraordinary occurrences and officer-involved shootings. Through parameters set by City of Chicago code, Chicago Police directives, and Illinois law – invalidating and/or transferring complaints, through various mechanisms – the majority of allegations and weapons discharge notifications logged by IPRA are purged. According to its quarterly reports, IPRA referred 72 percent of its entire log to the Bureau of Internal Affairs in the Chicago Police Department, from 2012 to 2014. Created on the promise of independent, civilian-led oversight of police misconduct, IPRA reverts the majority of allegations received back to Chicago Police, with complaints related to “improper search,” “criminal misconduct,” “arrest/lockup,” “search warrants,” “conduct unbecoming an officer” and “medical integrity” among those in the reported jurisdiction of Internal Affairs. Of the minority of its log retained after referrals, IPRA assigned only 30 percent – or 8 percent of its total log – for investigation. An Illinois statute, the Uniform Peace Officers’ Disciplinary Act, requires that those submitting complaints of misconduct also submit sworn statements. Leading to the purging of hundreds of complaints submitted without statements in Chicago alone every year, Truthout found state law cited Chicago Police and university, municipal and county law enforcement agencies across the state, in addition to the Illinois State Police. The policy runs counter to law enforcement best practice recommendations – for serving as a deterrent by intimidating complainants via the threat of punishment by law if considered perjury – of the Department of Justice and International Association of Chiefs of Police. The requirement is specifically prevented as such by the attorney general of the State of New Jersey. Truthout will be examining the complaint process in-depth in a coming report. Per a Chicago Police directive, IPRA provides police officers accused of misconduct with the names of their complainants; the opportunity to review previous statements prior to questioning; and a period of 24 hours after the shooting of civilians before questioning takes place. Of 10 fatal shootings occurring between 2012 and 2014, with cases closed by IPRA, all were deemed “justified.” Many raise clear concerns of police bias, given aberrations in video, forensic and testimonial evidence; findings contradictory with other legal experts; and eyewitnesses unpursued. Six victims were shot in the back; three were unarmed. In one instance, an alleged weapon was never recovered. In multiple instances, an alleged weapon was in dispute. Seven were youth, 16 to 24 years old. All of the victims were men; nine were Black and one was Hispanic. In the series to come, Truthout will be examining the investigations. IPRA investigators are trained by Chicago police officers and alongside them: The oversight agency cited the attendance of its staff at six separate trainings led by Chicago Police, including regular attendance at Chicago Police Training Academy, as well as three trainings led by military or other law enforcement agencies, in its most recent biannual report. Since January 2012, IPRA has reportedly referred 190 cases to Cook County State’s Attorney Anita Alvarez, whose office will bring former Chicago police officer Dante Servin to trial in mid-April for the shooting death of unarmed Rekia Boyd, the first criminal charges faced by a Chicago police officer in 15 years. In 2011, Alvarez’s office declined to press criminal charges against Chicago police officer Gildardo Sierra for the shooting death of unarmed Flint Farmer; Sierra shot Farmer seven times, discharging the last three shots at close range while Farmer lay face down, as captured on dash cam video, killing him. It was the eighth shooting in which Sierra was involved. City of Chicago 2015 Budget ordinance, Positions and Salaries. Another $581,242 attributed to the agencies is budgeted separately in Appropriations. In the series to come, Truthout will explore the life of Pedro Rios Jr., and the pattern and practice of Chicago police violence and impunity. The coming reports will also provide updates resulting from ongoing requests for comment from involved agencies and the fulfillment of records requested under the Illinois Freedom of Information Act, in progress with the Independent Police Review Authority, the Chicago Police Department and the office of Cook County State’s Attorney Anita Alvarez. In January, Truthout interviewed IPRA’s spokesperson, who has not yet responded to multiple follow up requests for comment. The agency’s quarterly reports detailing allegations and notifications logged, and referrals, can be found at www.iprachicago.org/resources.html. Alex Cachinero-Gorman contributed interpretation services to this report. 1. Calculated by Truthout as length of time between date of the shooting and date attributed to the closed investigation report by IPRA. 2. Although an initial media account attributes a 10:07 pm time of death to the Cook County Medical Examiner’s office, Rios’ official death certificate records a time span of more than two hours between time of injury and time of death, at 12:06 am – the time an investigator arrived to the scene and the only time on file, according to a Cook County spokesperson. While Department of Justice and Centers for Disease Control and Prevention handbooks on death reporting suggest an initial pronouncement and estimated time of actual death should exist, the medical examiner’s office maintains a policy that time of death is officially the time an investigator from their office arrives on the scene to pronounce it. As the autopsy report shows no evidence of medical treatment beyond connection to a monitor, amid varying policies and times cited, it remains unknown for certain if medical aid was needed and denied, at any point during the two hours Rios lay in an alley, although medical professionals Truthout spoke to found it unlikely the teen would have survived his injuries long. A record of non-transport by paramedics was requested of the Office of Emergency Management and Communications by way of a Freedom of Information Act request.